"This plant is an easy keeper suitable for plant enthusiasts and novices alike." "This easy keeper grows quickly and has a central trunk from which the leaves branch out." "It’s no secret that succulents are low-maintenance, thanks to their ability to store water and thrive under various conditions." "This plant has variegated green leaves and will produce white blooms and occasionally red berries." "To keep the peace with this lily, you will only need to provide it with low light and weekly watering." "This prolific grower will fill up your pot and multiply with many tiny offshoots if the growing conditions are right." "This dark green plant with tall, upright variegated leaves will do well in many home environments." If you want a hearty and healthy green vine to fill your home, look to the Heart Leaf Philodendron. This easy to care for plant has broad but short leaves and will grow well under a variety of conditions. It’s a great houseplant whether you have abundant light or low light — just don’t place it in direct sun. One other tip is not over or under water this plant — the top layer of soil should feel fairly dry by the time it’s ready to water again. Philodendrons are known to withstand being neglected on occasion. One person reported leaving for two months and upon returning found their Heart Leaf Philodendron to still be alive and healthy. This plant is an easy keeper suitable for plant enthusiasts and novices alike. It is important to note that philodendrons are poisonous if ingested — so keep it out of the reach of children and pets. If you have it as a hanging plant, this should be easy to accomplish. If you want a mini-tree that is suitable as an indoor plant, the Schefflera Amate — also known as an umbrella tree, is a great choice. This easy keeper grows quickly and has a central trunk from which the leaves branch out. It prefers a more humid environment but can tolerate drier air also. If the leaves are turning brown, a spritz with water can help to provide some humidity for this tropical plant. This plant likes bright, indirect light but can tolerate a variety of lighting conditions. It makes a great choice to add a tropical feel to your living room with its shiny green leaves. Beware, though, if you have dogs or cats that might nibble on the foliage — since this plant is toxic to both. For succulents that will add a touch of dusty color to your home or office, the Desert Rose Echeveria is a popular choice. It’s no secret that succulents are low-maintenance, thanks to their ability to store water and thrive under various conditions. If you don’t think you can be held to a regular, frequent watering schedule, then succulents might be the best houseplant for you. This three-pack of succulents offers a surprise as to which particular varieties you’ll receive, but most people are pleased with the selection and value of the plants received. Place them on a shelf, in a bathroom, or as the centerpiece of a terrarium. It’s worth noting that succulents are known to be superior filters of the air around them, but they are attractive and easy to keep — earning them a spot on our list! Interested in reading more reviews? Take a look at our selection of the best succulents. For a home that doesn’t receive a lot of natural light, the selection of indoor house plants that will thrive is more limited — but there are still some great choices. Our top pick is the Chinese Evergreen. This plant has variegated green leaves and will produce white blooms and occasionally red berries, which is relatively unique for an indoor plant with low light needs. 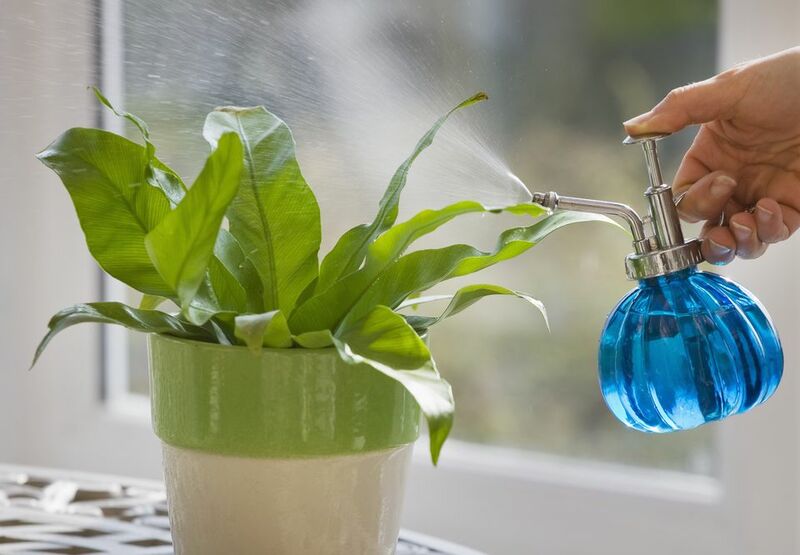 It does require some humidity, so you may need to mist the plant with a little water if your environment is dry. This houseplant will remove benzene and formaldehyde from the air, though not as efficiently as some other indoor plants. Note that the plant arrives in a ‘grower pot’ that you will most likely want to replace at some point, but wait until the plant has adjusted to its new environment in your home. The Chinese Evergreen does contain calcium oxalate, so it is poisonous if ingested. If you want a flowering plant that is also a superstar at removing common air pollutants, the Peace Lily is our top recommendation. This plant has relatively long, straight leaves that are dark green in color, and accented by the occasional white lily flower. What really makes the Peace Lily stand out is the fact that it removes three of the most common volatile organic compounds (VOCs) from the air, such as benzene, formaldehyde, and trichloroethylene. To keep the peace with this lily, you will only need to provide it with low light and weekly watering. If the flowers begin to droop, then it’s time to give it a drink! Overall, it’s an easy-keeper that looks nice and greatly contributes to the air quality of your home. It is poisonous to children and pets — so don’t leave it in a spot that might be easily accessed. If you’re looking for a plant that will adapt easily and make it appear that you have a green thumb, the Spider Plant is the right choice for you! This prolific grower will fill up your pot and multiply with many tiny offshoots if the growing conditions are right. It only needs indirect light (artificial light is acceptable also), and to be kept away from intense heat. It prefers cool or average home temperatures, which is true of most people also. The spider plant will filter common contaminants from the air such as formaldehyde, carbon monoxide, and xylene. Take advantage of its ability to survive with artificial light by placing it on your desk at the office. It will clean the air and provide some greenery in your workspace. Since it’s easy to maintain, you won’t worry about it over long weekends or during vacation time. The Snake Plant is a great indoor plant for the bathroom or bedroom, but will contribute to cleaner air in any corner of the home. This dark green plant with tall, upright variegated leaves will do well in many home environments. However, it enjoys humidity — making it a perfect choice for the bathroom. It also filters formaldehyde, which is found in a variety of common bathroom products. The snake plant is also our top choice for the bedroom since it absorbs carbon dioxide and releases oxygen at night. This is opposite of many plants, which release oxygen during the day. So, if you place a snake plant in your bedroom, you may enjoy a little extra oxygen intake during the night. Note that this plant is relatively tall — with people reporting that the ones they ordered arrived with a height of 2.5 to 3 feet. So make sure you have a spot that will accommodate this rather tall air filtering plant.